March 17th is Saint Patricks Day. 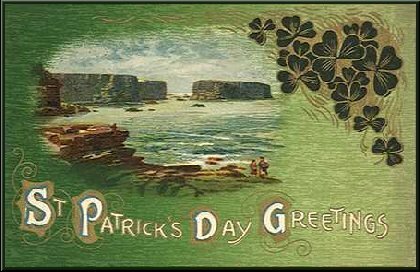 It is the day for the Irish... and friends of the Irish..to celebrate with anything Green and Gold (mainly Green), and a day to hold the Lucky Shamrock in high esteem. When the party REALLY gets going..watch out for the GREEN BEER.. typically served in Pubs and at partys wherever the Irish community are enjoying the celebration. Saint Patricks Day is, traditionally, a day for offering prayers to missionaries and a day of spiritual renewal. Mass is held in the mornings as it is actually a religous holiday. Saint Patrick is believed to have been born in the late forth century and is the Patron Saint and National Apostle of Ireland. It is believed that he is the one who brought Christianity to Ireland. He was self-described as a humble-minded man who was Gods instrument, by which the masses of pagan idol worshipers would be brought to the correct religous beliefs of Christianity. He was thankful to God for granting him this duty. It is told that Saint Patrick chased all of the Snakes from Ireland. However, this story is only a symbolic one. There were never any snakes in Ireland. The story is symbolic of the fact that Saint Patrick cleared Ireland of false Idols, many being images of snakes, that were worshiped by the pagan religons that once thrived there. March 17th is believed to be the date that Saint Patrick died. I'm sure we've all heard the stories of the "little people".. or "Leprechans" of Ireland. They are little guys who horde Gold. It is told that if we can CATCH a Leprechan.. he will have to give us his "Pot-O-Gold" to once again gain his freedom. In some stories I've heard that a Leprechan can also grant wishes! 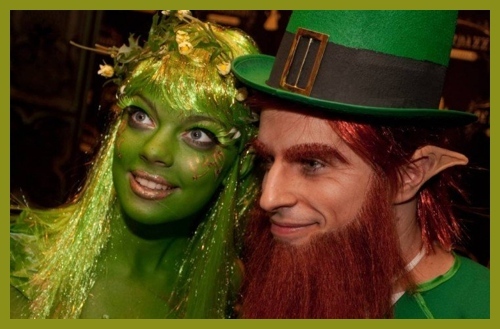 Dressing up as a Leprechan for Saint Paddys Day is one AWESOME way to join in the FUN of the Day. Have a GREAT DAY and DO IT in GREEN!